All cities are created by me unless otherwise noted. If you have a city your can submit, it would be appreciated. Submission instructions here. Please also include a short description with the city file (or I'll have to make one up myself). 04/09/99 Nicely designed city; has lots of waterways flowing through the city. The average residential has high land values, and commercial has very high to astronomical. A flaw in the city layout would be the inefficient road/subway systems crossing the canals. 04/08/99 A city with complex freeway systems. Very nice residential neighborhoods around a lake in the center and scattered ponds. Downtown centered around the lake. The reason for my low funds is because a neighboring city cancelled a power deal and I didn't know, continuing to spend all my money (The city is gaining money now, slowly). 03/18/99 A city of jetties... most of the residential and commercial zone have the highest land value. Every building is close to water; lots of marinas. Some complaints of inefficient transportation system. 03/10/99 My biggest city yet! Much of the city is has astronomical land values. Big area of dense commercial with all the biggest buildings. Medium land values in most of my industrial area. Lots of waterways and marinas. A pretty accurate replica of Vancouver, the city where he (and I) live in. The city is still being worked on, and will be updated to reflect the changes - built entirely without cheating. 02/23/99 Built from my Badlands terrain. When viewing this city, try to keep it at the angle where no buildings are behind cliffs, as SC3000 seems to get glitchy displaying those buildings. There is one angle where I built my city from where no structures are obscured from view. Anyways, like most of my cities, this one has a downtown area of tall commercial buildings. Also experimented (unsuccessfully) with farms. 02/15/99 A city with many levels of ground ranging from sea level to a couple thousand meters above. Low crime rate and pollution, high life expectancy and EQ. My second presentable city, and by far better than the first. Also a nice downtown core with some astronomical land values. 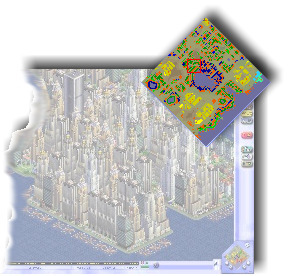 02/05/99 My first city made from the first bitmap terrain I created. The city is centered around a bay, with mountains in the inland and a double freeway running through it.